Cryptocurrencies continue consolidating as the next moves are awaited. All three have clear caps they must cross in order to move higher. Not much has changed in the world of cryptocurrencies in the past 24 hours. Prices have been stable and no major breaking news came out. However, technical levels have realigned and things look clearer now. 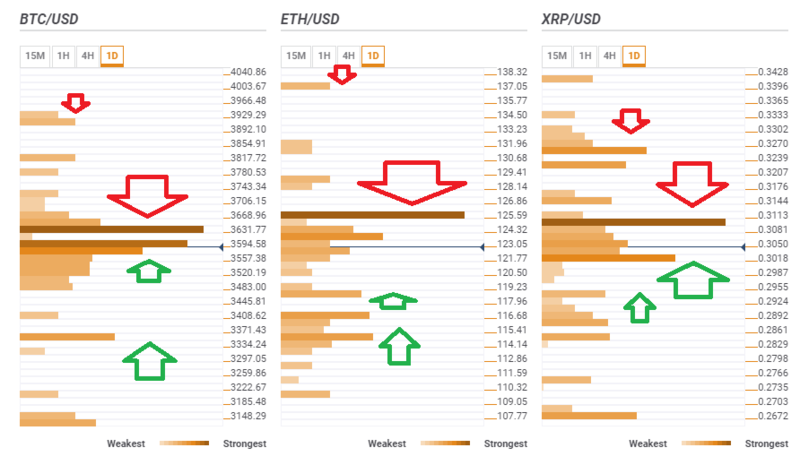 Bitcoin, Ethereum, and Ripple all have clear barriers to climb over. Breaking above these levels may unleash a bullish run. This is what the Crypto Confluence Detector shows. Bitcoin faces fierce resistance at $3,631 which is the convergence of the Simple Moving average 5-1d, yesterday's high, the Pivot Point one-day Resistance 1, the Fibonacci 23.6% one-week, and the Bollinger Band 4h-Upper. Breaking above that level may send it to around $3,910 where the Pivot Point one-month Resistance 1 awaits BTC/USD. Looking down, there is some support around $3,557 which is yesterday's low, the PP 1d-S1, the BB 4h-Lower, the Fibonacci 23.6% one-day, the Fibonacci 38.2% one-week, and a few other lines. The downside target is $3,350 where last week's low meets last month's low. Ethereum, which led the surge, is currently leading the fall. It must surpass $125.59 which is the confluence of the SMA 50-1d, the PP 1d-R1, the BB 1d-Upper, the BB 4h-Upper, and the Fibonacci 38.2% one-month. The upside potential is $137.05 where we see the PP one-week R2. Support is at $118.50 where we note the juncture of the Fibonacci 23.6% one-week and yesterday's low. Further down, ETH/USD is supported at $116.68 is where the Fibonacci 23.6% one-month and the BB 4h-Lower converge. Ripple has its hard cap at $0.3113 which is the confluence of the BB 4h-Upper, the previous day's high, the Fibonacci 38.2% one-week, the Fibonacci 23.6% one-month, and more. The upside here is somewhat more limited: At $0.3250, XRP/USD faces the convergence of the Fibonacci 38.2% one-month and the BB 1d-Upper. Support for XRP/USD awaits at $0.3018 which is a dense cluster including the Fibonacci 61.8% one-week, the SMA 200-1h, the SMA 50-4h, the BB 1h-Lower, and the Fibonacci 61.8% one-day.